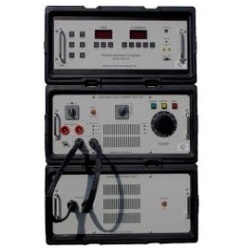 The ETI PI-1600 is a Primary Injection Test Set that will test low-voltage, molded-case and metal-clad, direct acting AC circuit breakers from various manufacturers. The PI-1600 tests breakers rated up to 1600 Amperes. The units are housed in rugged interlocking suitcase-size enclosures. Each piece weighs no more than 125 pounds, allowing one person hand truck mobility.